Download "UNITED STATES DISTRICT COURT FOR THE EASTERN DISTRICT OF NEW YORK. DAVID HIMBER V. AUTOMOBILE CLUB OF NEW YORK, INC. CASE NO. : 09 Civ." 1 UNITED STATES DISTRICT COURT FOR THE EASTERN DISTRICT OF NEW YORK DAVID HIMBER V. AUTOMOBILE CLUB OF NEW YORK, INC. CASE NO. : 09 Civ (SJF) NOTICE OF CLASS ACTION SETTLEMENT All persons who received electronically printed receipts from any Automobile Club of New York, Inc. branch at the point of sale or transaction, in a transaction occurring between June 4, 2008 and September 28, 2009 may be eligible to receive a payment of up to $ The settlement resolves a lawsuit alleging violations of a requirement imposed by the Fair and Accurate Credit Transactions Act ( FACTA ) requiring that credit card expiration dates not be printed on receipts. 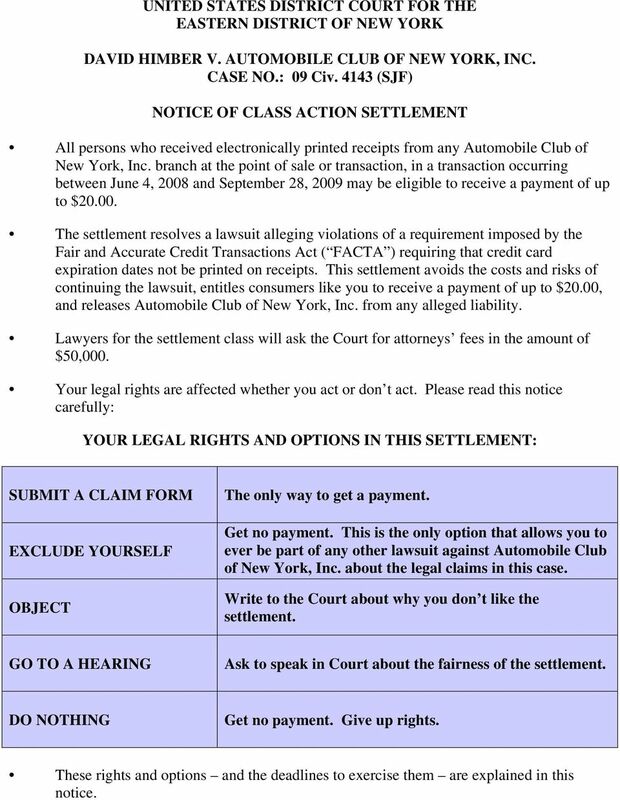 This settlement avoids the costs and risks of continuing the lawsuit, entitles consumers like you to receive a payment of up to $20.00, and releases Automobile Club of New York, Inc. from any alleged liability. Lawyers for the settlement class will ask the Court for attorneys fees in the amount of $50,000. Your legal rights are affected whether you act or don t act. Please read this notice carefully: YOUR LEGAL RIGHTS AND OPTIONS IN THIS SETTLEMENT: SUBMIT A CLAIM FORM EXCLUDE YOURSELF OBJECT The only way to get a payment. Get no payment. This is the only option that allows you to ever be part of any other lawsuit against Automobile Club of New York, Inc. about the legal claims in this case. Write to the Court about why you don t like the settlement. GO TO A HEARING Ask to speak in Court about the fairness of the settlement. DO NOTHING Get no payment. Give up rights. These rights and options and the deadlines to exercise them are explained in this notice. 2 The Court in charge of this case still has to decide whether to approve the settlement. Payments will be made if the Court approves the settlement and after appeals are resolved. Please be patient. 1. What is this lawsuit about? 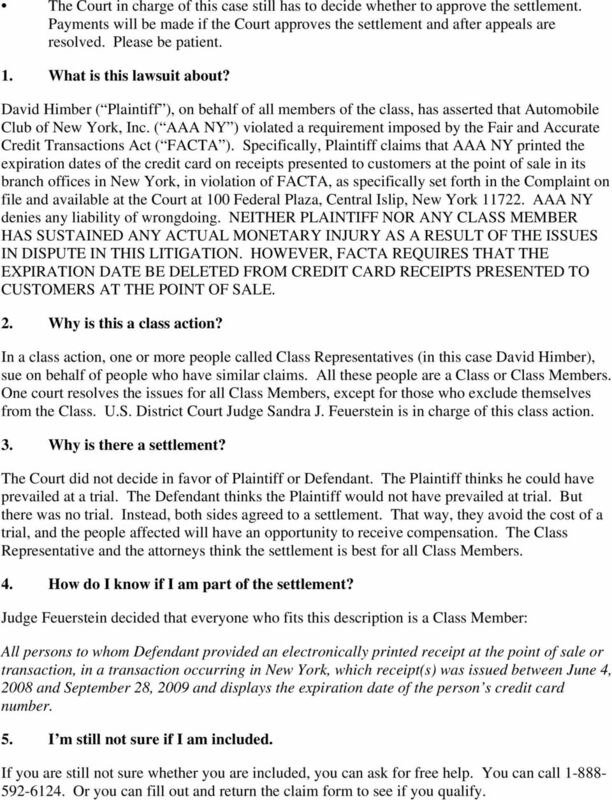 David Himber ( Plaintiff ), on behalf of all members of the class, has asserted that Automobile Club of New York, Inc. ( AAA NY ) violated a requirement imposed by the Fair and Accurate Credit Transactions Act ( FACTA ). Specifically, Plaintiff claims that AAA NY printed the expiration dates of the credit card on receipts presented to customers at the point of sale in its branch offices in New York, in violation of FACTA, as specifically set forth in the Complaint on file and available at the Court at 100 Federal Plaza, Central Islip, New York AAA NY denies any liability of wrongdoing. NEITHER PLAINTIFF NOR ANY CLASS MEMBER HAS SUSTAINED ANY ACTUAL MONETARY INJURY AS A RESULT OF THE ISSUES IN DISPUTE IN THIS LITIGATION. HOWEVER, FACTA REQUIRES THAT THE EXPIRATION DATE BE DELETED FROM CREDIT CARD RECEIPTS PRESENTED TO CUSTOMERS AT THE POINT OF SALE. 2. Why is this a class action? In a class action, one or more people called Class Representatives (in this case David Himber), sue on behalf of people who have similar claims. All these people are a Class or Class Members. One court resolves the issues for all Class Members, except for those who exclude themselves from the Class. U.S. District Court Judge Sandra J. Feuerstein is in charge of this class action. 3. Why is there a settlement? The Court did not decide in favor of Plaintiff or Defendant. The Plaintiff thinks he could have prevailed at a trial. The Defendant thinks the Plaintiff would not have prevailed at trial. But there was no trial. Instead, both sides agreed to a settlement. That way, they avoid the cost of a trial, and the people affected will have an opportunity to receive compensation. The Class Representative and the attorneys think the settlement is best for all Class Members. 4. How do I know if I am part of the settlement? Judge Feuerstein decided that everyone who fits this description is a Class Member: All persons to whom Defendant provided an electronically printed receipt at the point of sale or transaction, in a transaction occurring in New York, which receipt(s) was issued between June 4, 2008 and September 28, 2009 and displays the expiration date of the person s credit card number. 5. I m still not sure if I am included. If you are still not sure whether you are included, you can ask for free help. You can call Or you can fill out and return the claim form to see if you qualify. 3 6. What does the settlement provide? AAA NY has agreed to pay $150,000 into an escrow account which will constitute the Settlement Fund. If the settlement is approved by the Court, the Settlement Fund will be used to pay (1) all costs to provide notice to the class and to administer and distribute the settlement monies; (2) $50,000 to Plaintiff s attorneys as attorneys fees; and (3) $1,500 to David Himber for his individual claim and for his incentive award for his services as Class Representative. The amount remaining will be distributed to Class Members in the form of checks in the amount of $20.00, unless there are more valid claims filed than there are remaining monies in the Settlement Fund. If there are more claims than can be paid with the remaining monies, then the remaining Settlement Fund monies shall be divided equally amongst all class members who send in a valid claim form. Should any monies remain in the Settlement Fund after all claims and all above-referenced costs are paid, AAA NY shall make a donation to Safe Street Fund, Inc., a charity selected by AAA NY. The settlement also imposes certain other requirements, which are set forth in detail in the Settlement Agreement. 7. How do I become a Class Member entitled to a settlement payment? 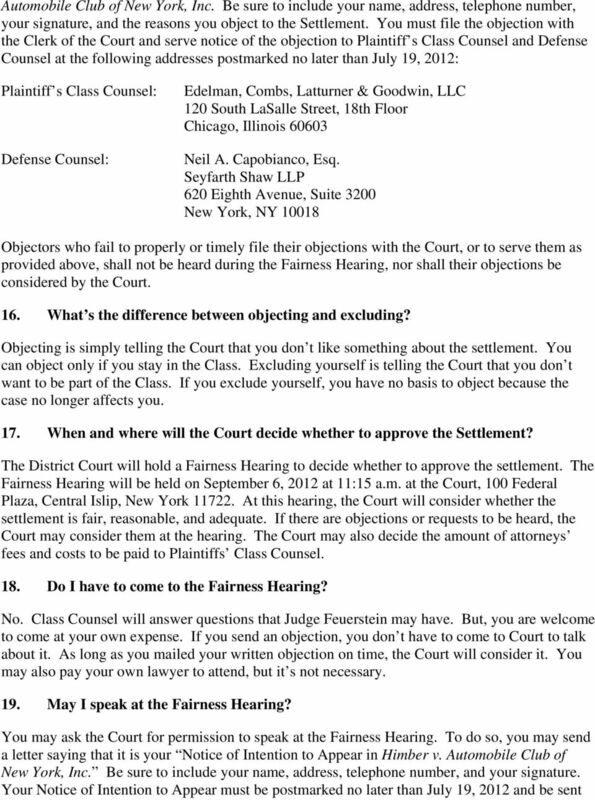 If you believe you are a member of the class and desire to participate in this settlement, you should completely fill out the Claim Form that accompanies this Notice and return it to the following address: Edelman, Combs, Latturner & Goodwin, LLC (Attn: RM), 120 South LaSalle Street, Suite 1800, Chicago, Illinois The Claim Form must be postmarked by August 3, Failure to fully follow the procedures will result in a class member receiving no relief under the settlement, but nonetheless being bound by any judgments, orders, and releases in this case. 8. When would I receive a payment? The Court will hold a hearing on September 6, 2012 at 11:15 a.m. to decide whether to approve the settlement. If Judge Feuerstein approves the settlement, after that, there may be one or more appeals. If there is an appeal, it is always uncertain whether the appeal can be resolved, and resolving it can take time, perhaps more than a year. Please be patient. 9. What am I giving up to get a payment or stay in the Class? 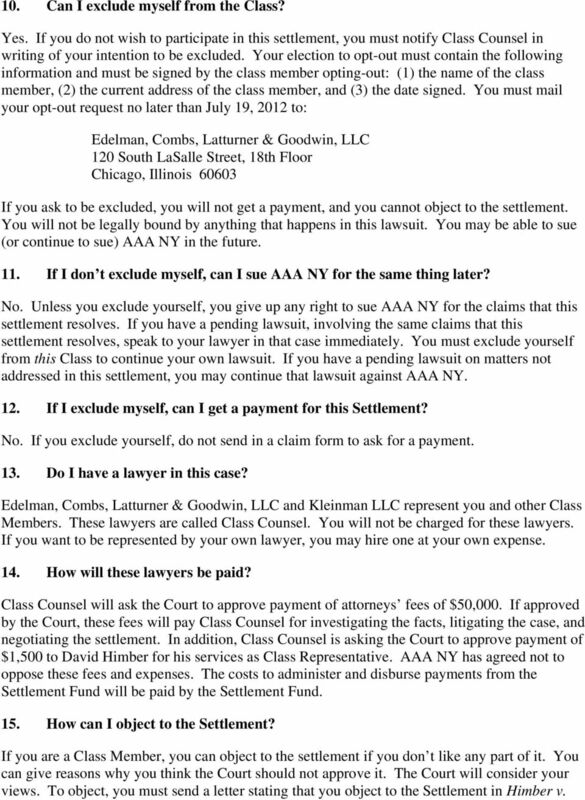 Unless you exclude yourself, you will be a member of the class, and that means you can t sue, continue to sue, or be part of any other lawsuit against AAA NY s about the legal issues in this case. It also means that all of the Court s orders will apply to you and legally bind you. 4 10. Can I exclude myself from the Class? Yes. If you do not wish to participate in this settlement, you must notify Class Counsel in writing of your intention to be excluded. Your election to opt-out must contain the following information and must be signed by the class member opting-out: (1) the name of the class member, (2) the current address of the class member, and (3) the date signed. You must mail your opt-out request no later than July 19, 2012 to: Edelman, Combs, Latturner & Goodwin, LLC 120 South LaSalle Street, 18th Floor Chicago, Illinois If you ask to be excluded, you will not get a payment, and you cannot object to the settlement. You will not be legally bound by anything that happens in this lawsuit. You may be able to sue (or continue to sue) AAA NY in the future. 11. If I don t exclude myself, can I sue AAA NY for the same thing later? No. Unless you exclude yourself, you give up any right to sue AAA NY for the claims that this settlement resolves. If you have a pending lawsuit, involving the same claims that this settlement resolves, speak to your lawyer in that case immediately. You must exclude yourself from this Class to continue your own lawsuit. If you have a pending lawsuit on matters not addressed in this settlement, you may continue that lawsuit against AAA NY. 12. If I exclude myself, can I get a payment for this Settlement? No. If you exclude yourself, do not send in a claim form to ask for a payment. 13. Do I have a lawyer in this case? Edelman, Combs, Latturner & Goodwin, LLC and Kleinman LLC represent you and other Class Members. These lawyers are called Class Counsel. You will not be charged for these lawyers. If you want to be represented by your own lawyer, you may hire one at your own expense. 14. How will these lawyers be paid? Class Counsel will ask the Court to approve payment of attorneys fees of $50,000. If approved by the Court, these fees will pay Class Counsel for investigating the facts, litigating the case, and negotiating the settlement. In addition, Class Counsel is asking the Court to approve payment of $1,500 to David Himber for his services as Class Representative. AAA NY has agreed not to oppose these fees and expenses. The costs to administer and disburse payments from the Settlement Fund will be paid by the Settlement Fund. 15. How can I object to the Settlement? 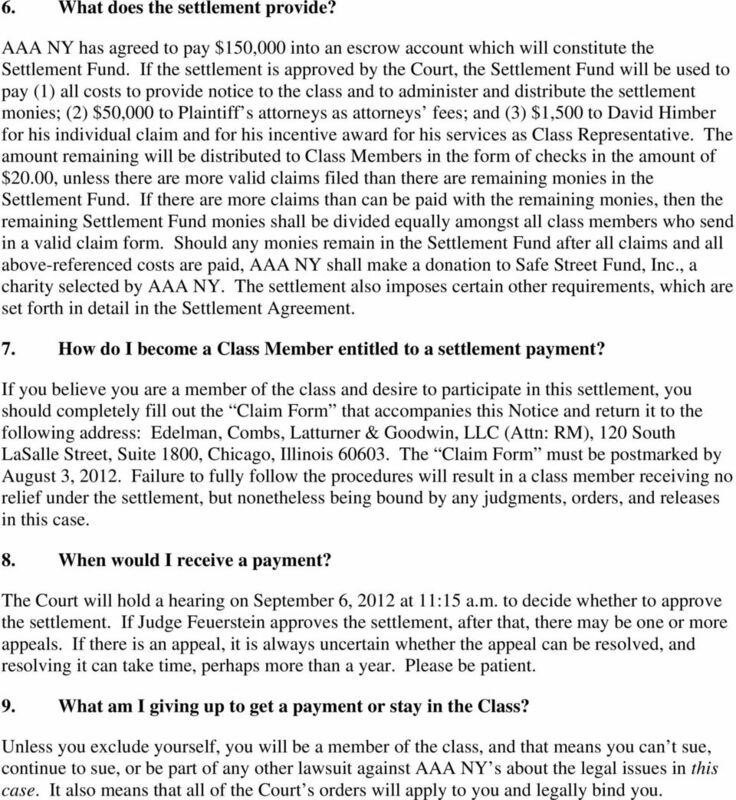 If you are a Class Member, you can object to the settlement if you don t like any part of it. You can give reasons why you think the Court should not approve it. The Court will consider your views. To object, you must send a letter stating that you object to the Settlement in Himber v.
6 to the Clerk of the Court, Class Counsel, and Defense Counsel at the addresses in question 15. You cannot speak at the hearing if you excluded yourself. 20. What happens if I do nothing at all? If you do nothing, you will not get a payment from this settlement. But unless you exclude yourself, you won t be able to start a lawsuit, continue with a lawsuit, or be part of any other lawsuit against AAA NY about the legal issues in this case, ever again. 21. How do I get more information? The foregoing is only a summary of the circumstances surrounding the litigation, the claim asserted, the class, the settlement, and related matters. You may seek the advice and guidance of your own private attorney, at your expense, if you desire. 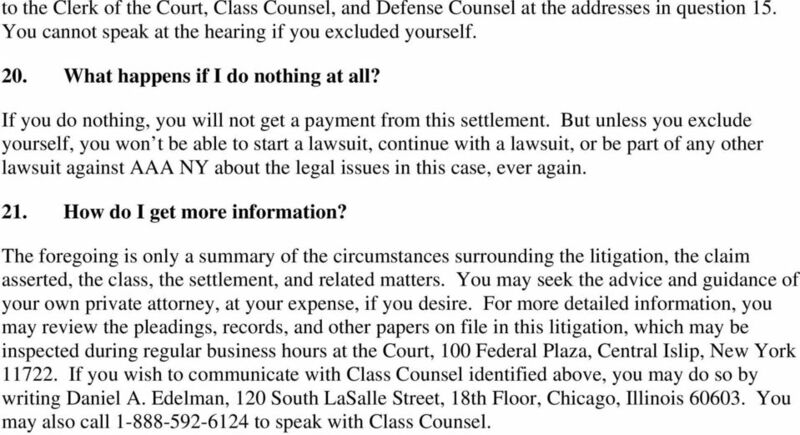 For more detailed information, you may review the pleadings, records, and other papers on file in this litigation, which may be inspected during regular business hours at the Court, 100 Federal Plaza, Central Islip, New York If you wish to communicate with Class Counsel identified above, you may do so by writing Daniel A. Edelman, 120 South LaSalle Street, 18th Floor, Chicago, Illinois You may also call to speak with Class Counsel. Case3:12-cv-01377-SI Document89-1 Filed10/09/13 Page1 of 12. A federal court authorized this notice. This is not a solicitation from a lawyer. SUPERIOR COURT OF THE STATE OF CALIFORNIA, COUNTY OF SACRAMENTO. You may be entitled to get benefits from a class action settlement. If you bought Kettle Brand Products. Between January 3, 2010 and February 24, 2015 You Could Receive Money From a Class Action Settlement. UNITED STATES DISTRICT COURT FOR THE SOUTHERN DISTRICT OF FLORIDA If you bought Kettle Brand Products Between January 3, 2010 and February 24, 2015 You Could Receive Money From a Class Action Settlement.